Text: Aya Shomura, this is something entirely different from what people have to come to think of as staying in Ubud. Launched in early 2015, the hotel purveys the cultural richness and artisanal heritage of Ubud in an affordable yet luxurious setting – offering all the amenities of a high-end resort in an unpretentious location that encourages spatial awareness and healthy living. All Bisma Eight houses 38 spacious suites feature generous living and sleeping areas partitioned for privacy by sungkai wood panels. The rooms are steeped in natural light in the day, transforming into gently illuminated, restful cocoons at night. Its outdoor seating spots are quiet spaces of intimacy and refuge accompanied by the natural soundtrack of the nearby forest. The highlight of each room is a voluminous Japanese-inspired soaking tub crafted from aromatic cedar wood. A collaborative effort between Arte Architects & Associates (Bali) and Fuur Associates (Singapore), the two entities have strived to highlight the geographic context of Ubud with the use of southern walnut, bamboo, Balinese orange brick, as well as greenery clusters to lighten the interiors. 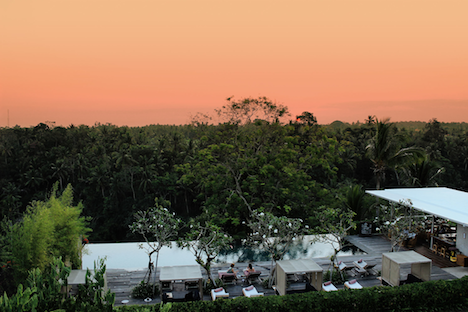 Then, overlooking an unfolding view of Pura Luhur Batukaru sits its rooftop infinity pool. An island-inspired lounge area, the Pool Pavilion features a modern tropical bar, as well as Ubud’s only temperature-controlled pool, to accommodate the island’s cooler climates from July to August. Other hotel amenities include a fully equipped gymnasium, Bisma Gardens (an organic farm), and a rooftop bar to wind down your day with. Bisma Eight will invite guests to discover a deeper revelation of the magic behind this beguiling town, and through it, transform your journey.